Studios are great! You can find great options in prime locations, but the open layout can leave one confused as far as decor and product placement goes. On this edition of upgrade your studio, here are 5 great ways to maximize your studio kitchen! Greenery is in, free food is never out. Hanging herb gardens and vertical vine fruits can be a great touch to your kitchen and can save you big bucks. It’s a total mouthful, but getting furniture that has more than one use is essential for studios. Dress up sturdy wooden boxes into bar stools. That’s storage and seating all in one. If you’re like the vast growing part of America, you work from home time to time. If your studio comes with an island, a bar, or a nice enclave, you can make that section work as an extended office. Through a Keurig in the corner and call it coffee shop. Adding shelves maximizes storage options and adding mirrors makes your space look bigger. You can check yourself out while grabbing something from your shelf. Mason jars, glass jars, box containers, cups, bottles, the list goes on. Containers add uniqueness and can house ingredients and utensils. Get containers with cool patterns or colors the fit your style! Every studio has the potential to feel like a mega mansion if you use your imagination. Each corner can be repurposed in a way that maximizes functionality and aesthetic appeal. 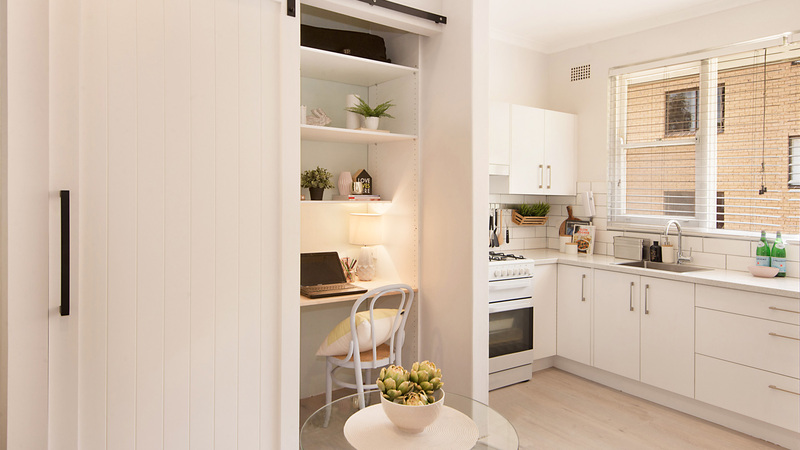 Let one of our Smart City Apartment Locating Agents help you find the perfect studio, so you can start expanding the use of your kitchen space.